DETROIT (AP) — Stephen Gonsalves is getting more comfortable running in from the bullpen to start a game. The Minnesota Twins, who have been experimenting with an “opening pitcher,” then bringing in a primary pitcher after an inning or two, got excellent results in Wednesday’s 8-2 win over the Detroit Tigers. Gabriel Moya started for the Twins, but was replaced by Gonsalves in the second inning, marking the sixth time this season they’ve used an opening pitcher. Gonsalves (1-2), who pitched six scoreless innings of one-hit ball and struck out four, picked up his first major league win. In his previous outing against Kansas City on Sept. 13, Gonsalves entered as the primary pitcher in the third inning, but did not factor into the decision. Against the Tigers, he entered in the second with his team holding a 4-0 lead. 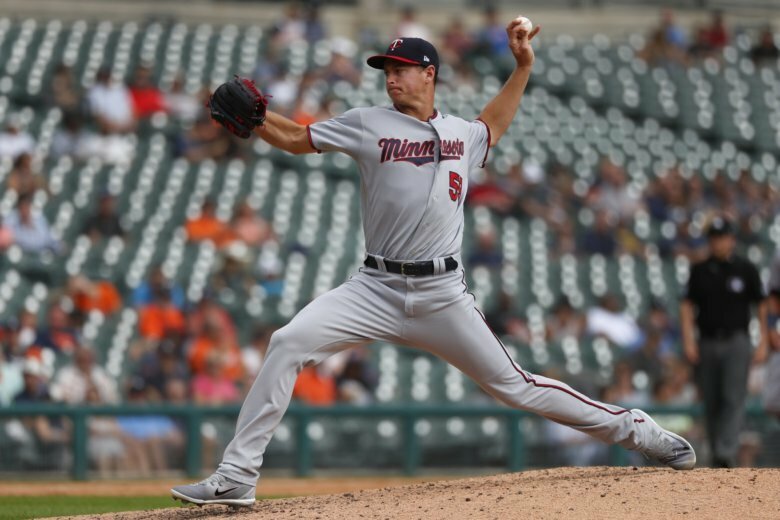 The Twins, who swept the three-game series from the Tigers, made Gonsalves’ entrance easier by putting up four runs in the top of the second off Detroit pitcher Spencer Turnbull (0-1), making his first major league start. Tyler Austin and Ehire Adrianza each had RBI singles to spark the rally. Tigers manager Ron Gardenhire isn’t sure if it will become a league-wide trend to use opening and primary pitchers. The Twins added a pair of runs in the fourth inning, which included Willians Astudillo’s RBI double, to open a 6-0 lead. They added two more in the eighth on Austin’s sacrifice fly and Astudillo’s RBI single. Adrianza finished with three hits, three runs scored and an RBI; Astudillo had two hits and three RBIs; and Austin added two hits, two RBIs and two runs scored. The Tigers got a pair of ninth-inning runs on Nicholas Castellanos’ RBI double and Mikie Mahtook’s sac fly. Detroit said it has acquired RHP Logan Shore from Oakland as the second player to be named later in the Mike Fiers trade. Shore was ranked as the A’s 14th-best minor-league prospect, according to MLB Pipeline. Twins: OF Eddie Rosario (right quad) and C Mitch Garver (concussion) were sent back to Minnesota and will not travel with the team to Oakland for its next series, Molitor said Wednesday. Tigers: 3B Jeimer Candelario left Tuesday’s game with a lumbar spine spasm. Gardenhire said Wednesday that Candelario is day to day. Twins: Play at Oakland on Friday. RHP Jose Berrios (11-11, 3.81 ERA) is scheduled to pitch for Minnesota. Tigers: Host Kansas City on Thursday night. Detroit LHP Matthew Boyd (9-12, 4.08) is scheduled to face Royals RHP Jorge Lopez (2-3, 4.64).